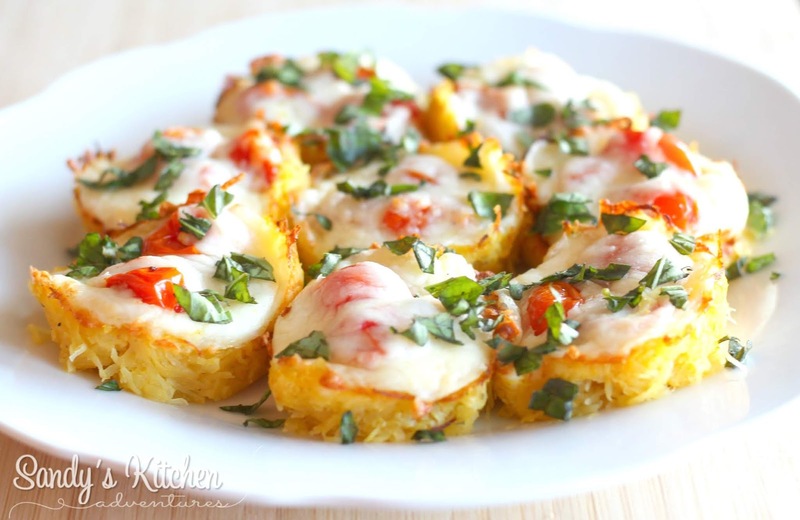 Do you have left over spaghetti squash and don't know what to do with it? Try this dish! 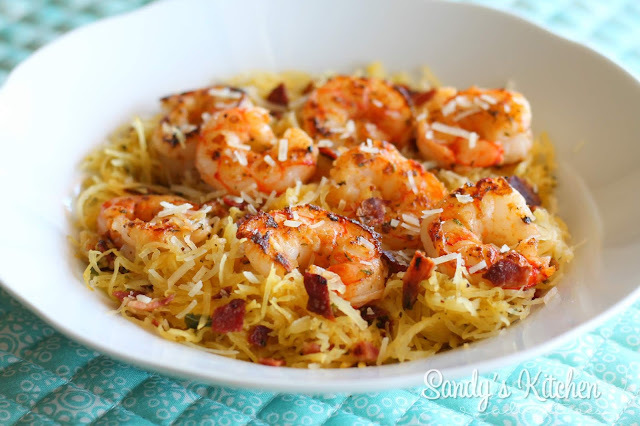 Once you have your spaghetti squash prepared, this recipe is a cinch to make! Add olive oil to a medium sized skillet over medium heat. Add minced garlic and saute for about 30 seconds. Then add raw shrimp and cook a few minutes on each side until cooked through and no longer pink. Set aside. Add light butter to the same skillet and melt over medium heat. 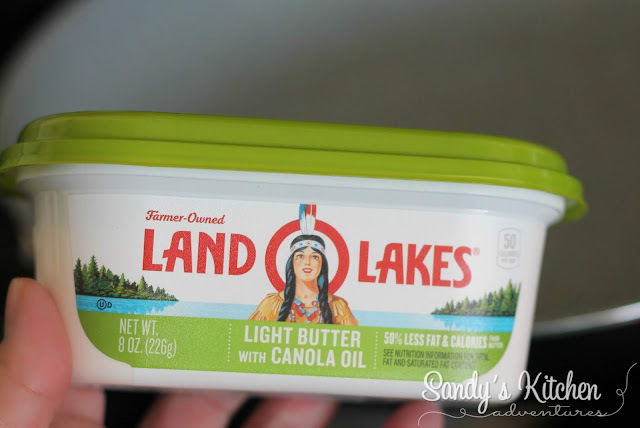 I like to use Land O' Lakes Light Butter with Canola Oil which only counts as 1 Healthy Fat for 1 tbsp. Once the butter has melted, toss in spaghetti squash, turkey bacon, garlic salt or salt, and black pepper until combined. Add the cooked shrimp and garnish with parmesan cheese. This makes 1 full Lean and Green so enjoy the whole dish! In a medium sized skillet over medium heat, add olive oil. Add minced garlic and saute for about 30 seconds or until light brown in color. Then add raw shrimp and cook a few minutes on each side until cooked through and no longer pink. Set aside. Add light butter to the same skillet. 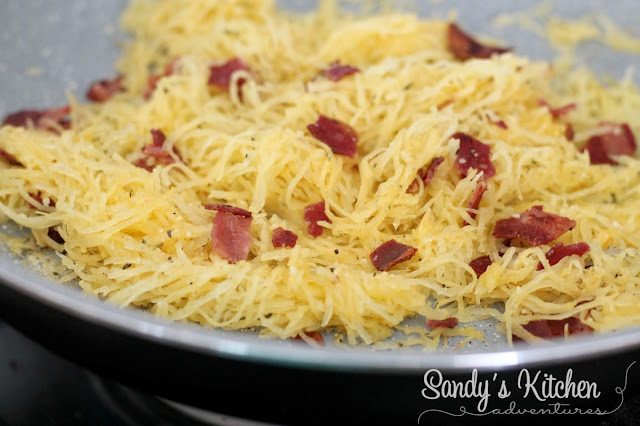 Once butter has melted, toss in spaghetti squash, garlic salt or salt, pepper, and crumbled bacon. Heat until warm about 2 to 3 min. 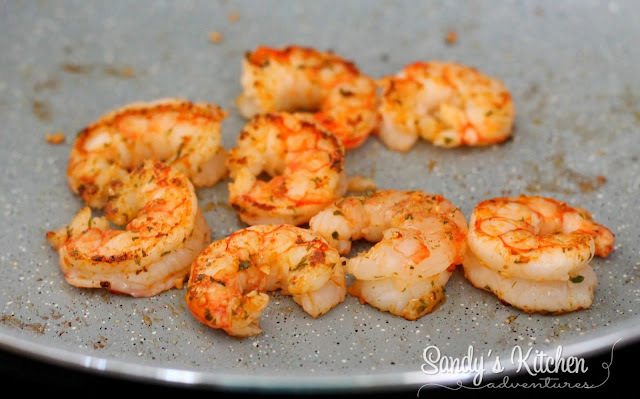 Add cooked shrimp and garnish with parmesan cheese. I have been making this recipe for years and did not realize it wasn't up on the blog! The shame! The shame! 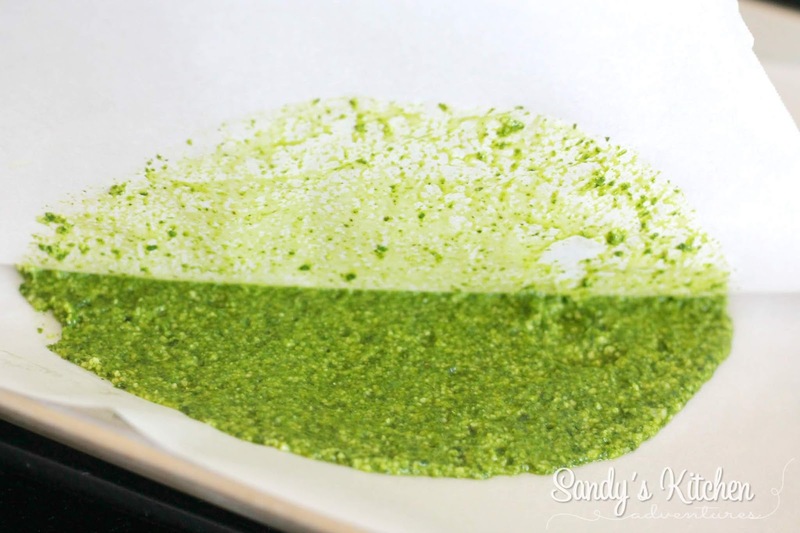 This recipe is so easy and only requires 3 ingredients! All you have to do is place the chicken breasts in the crock pot. Top it with your favorite salsa and some taco seasoning. Then let your crock pot work it's magic! When it is done, shred the chicken and mix it with the salsa mixture. So yummy! 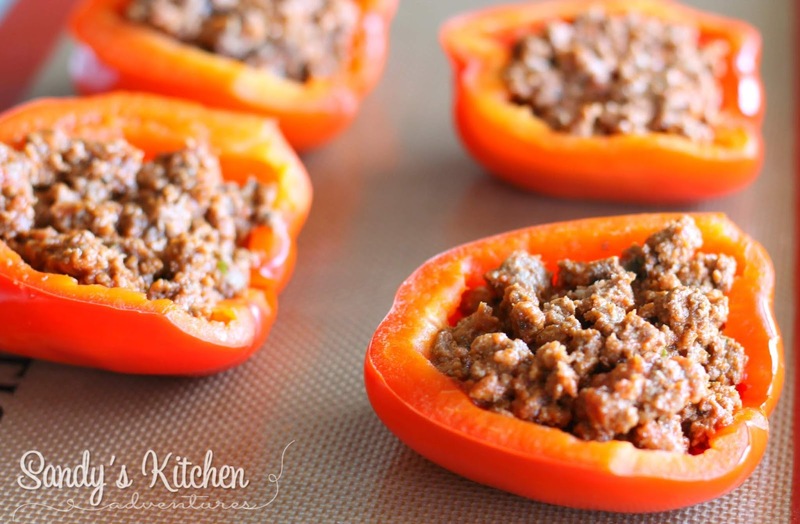 I served it with assorted sweet bell peppers I cooked in the air fryer but this would be delicious on cooked cauliflower rice as well! You do need to add 1 healthy fat to this dish. Sour cream or avocado are excellent choices! I hope you enjoy this super duper easy recipe as much as me! Top with salsa and taco seasoning. Cook 6 to 8 hours on LOW or on 4 hours on HIGH. Shred chicken with fork and stir chicken with salsa mixture. Serve with your choice of Greens and avocado or sour cream. Move over cauliflower crusts, there is something equally delicious! 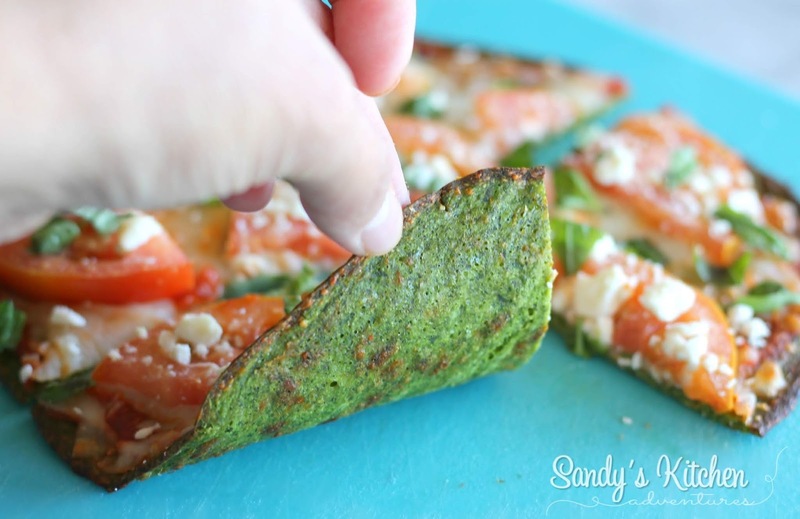 Spinach pizza crusts or wraps! Another low carb pizza alternative! 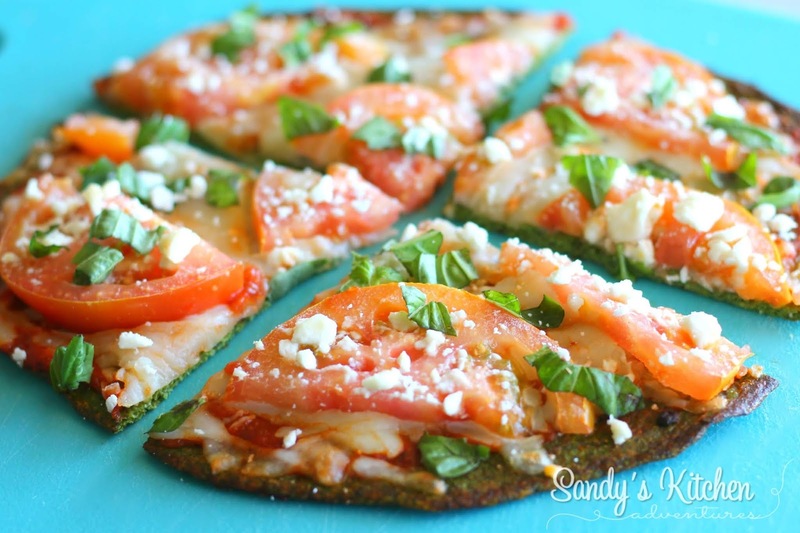 Add your favorite toppings and it tastes like pizza on flatbread. Yum, yum, yum! 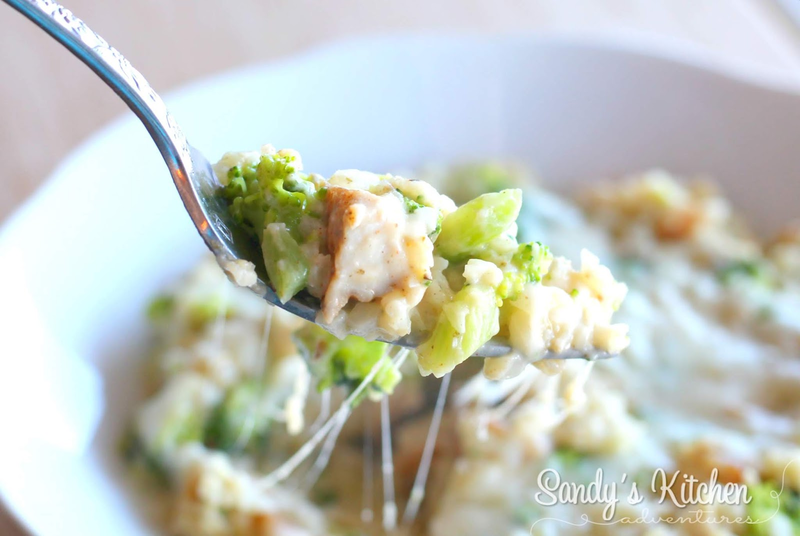 This recipe was originally shared by Ursula Garcia awhile back and I love how it is so versatile! It produces a flexible crust which makes perfect pizza crusts or wraps! I added 2.5 oz of rotisserie style chicken breasts (1/2 Leaner with turkey bacon) I picked up from the grocery store, 1 slice of turkey bacon (1/2 oz subtracted from protein), 1/4 cup sliced tomatoes (1/2 Green), 1/2 cup lettuce (1/2 Green) and 1 1/2 tbsp Bolhouse Classic Ranch Dressing (1/2 Healthy Fat). 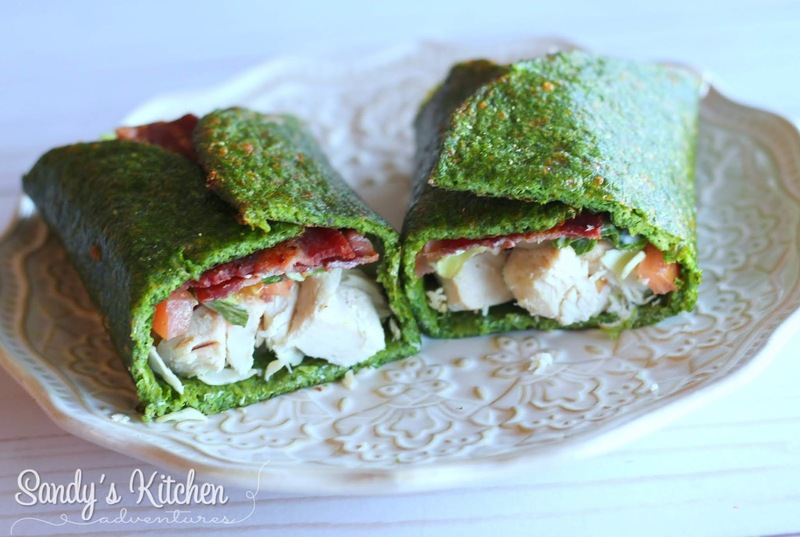 With the spinach wrap, it makes 1 full Lean and Green meal! Look at that beautiful green crust! 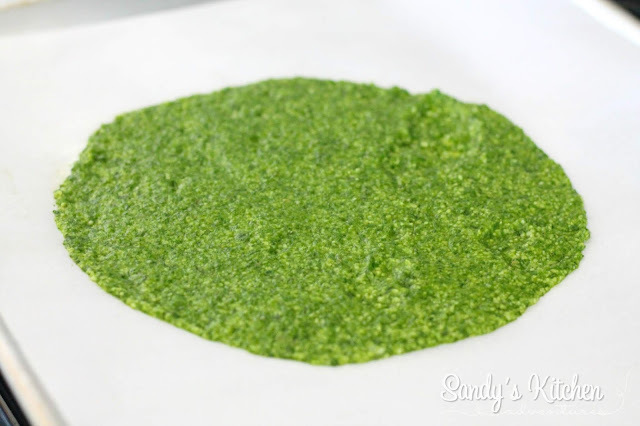 To begin the recipe, add spinach, mozzarella cheese, and dried basil to your food processor. Blend well. Stir in egg beaters until completely combined. 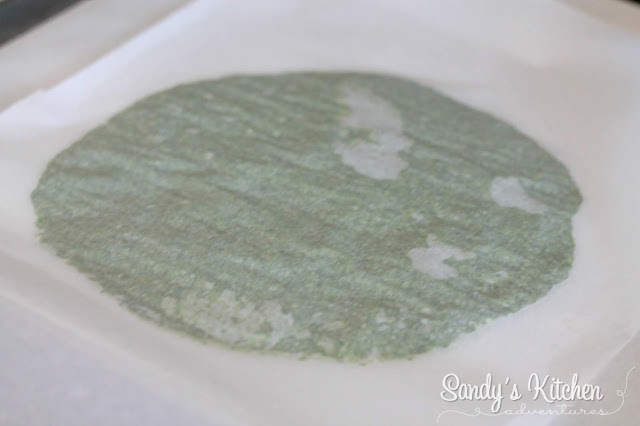 Pour mixture onto parchment paper forming a circle making it thin as possible. I like to use another piece of parchment paper on top of the mixture to flatten it out. Carefully lift the parchment paper off of the mixture. Bake at 425 degrees for 15 to 17 min or until edges get brown. If making a pizza, top with your favorite toppings and return to the oven for about 5 more min or until cheese has melted. For wraps, let cool a few more minutes and then add your desired fillings. A healthy dinner or lunch in less than 30 min! Yes please! Blend spinach, mozzarella cheese, and dried basil in a food processor. Spread mixture on parchment paper. Tip: I laid another piece of parchment paper over the mixture to flatten it out. Then slowly lifted the parchment paper. Bake for 15 to 17 min or until edges are brown. Add marinara sauce, mozzarella cheese, sliced tomatoes, and feta cheese. Bake for an additional 5 more minutes or until cheese has melted. 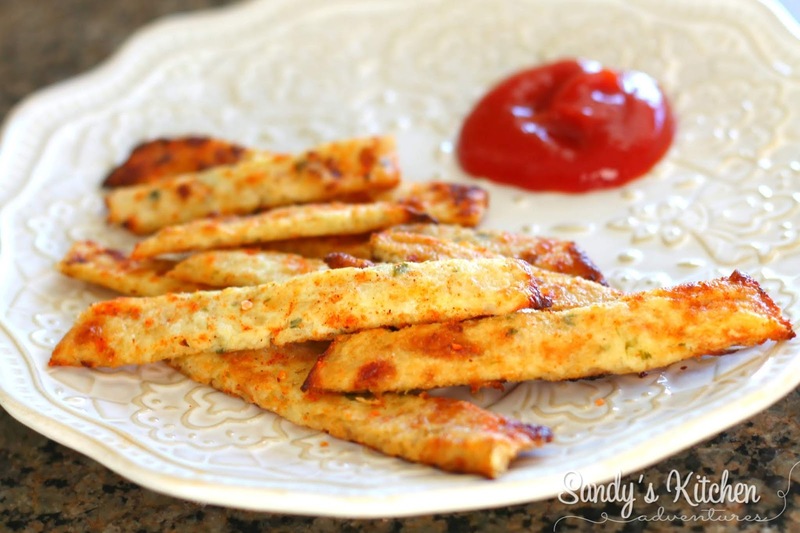 These "fries" made from the Cali'flour Flat breads are so delicious! Who would've thought they would make awesome "fries"? I bet these would pair nicely with a yummy crisp lettuce wrap! I seasoned the "fries" with Weber Garlic Sriracha Seasoning and added a tbsp of reduced sugar ketchup on the side. So good! Give them a try! Pre bake the Cali'flour flat breads in the oven on a vented pizza pan, pizza screen, or on a nonstick cookie sheet lined with parchment paper for about 5 min. Remove from oven and cut into strips to create fries. Season with spices of choice. Place back into oven and bake an additional 5 to 8 more min. Remove from oven and let cool for a few more min. Serve with ketchup. 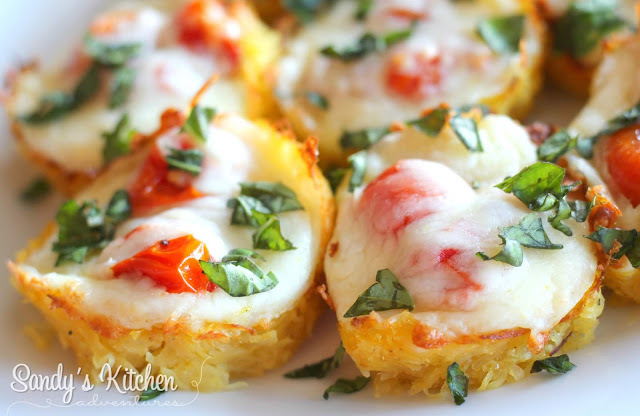 Roasted cherry tomatoes, mozzarella cheese, spaghetti squash, and fresh chopped basil make this dish a delicious refreshing meal! 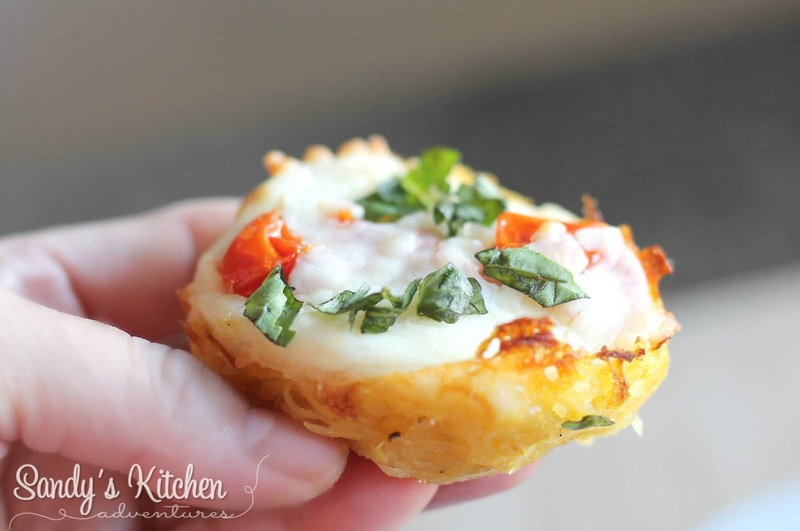 The muffin cups make this a fun twist on Caprese. 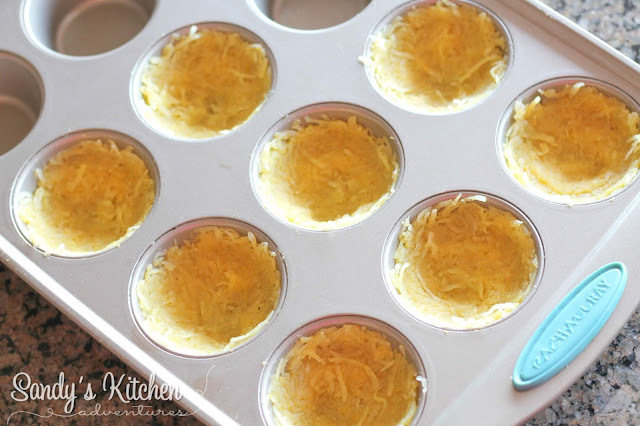 You can easily make this into one larger casserole, but I thought it would be really cute to make little spaghetti squash nests using muffin cups. You know... with Spring being around the corner and all. Before putting the cheese over the tomatoes, my 6 year old leans over to tell me that the roasted cherry tomatoes look like eggs in a nest. By golly, yes you are right! There you go! Perfect for Spring! Begin the recipe by preparing and cooking your spaghetti squash. You can prep your squash the day before! Cooked squash can lasts 3 to 5 days in the fridge. I included two ways in the recipe below, oven method or slow cooker method. I love roasting my spaghetti squash in the oven which brings out the subtle sweetness of the squash. 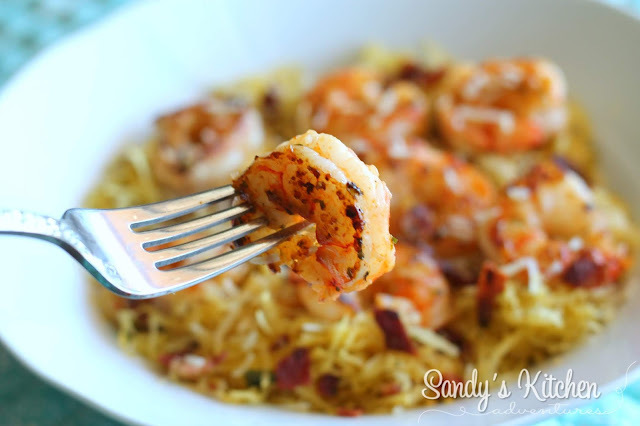 Using your Instant Pot, air fryer, or microwave or other options as well. Choose your preferred cooking method and reserve 2 cups of spaghetti squash strands for this recipe. Save the rest for another use. Mix 2 cups of spaghetti squash with salt, pepper, garlic powder, and 3 tbsp egg beaters. Scoop 1/4 cup of spaghetti squash into each muffin cup. Press down on the bottoms and sides to create nests. Place in a preheated oven for 20 min. 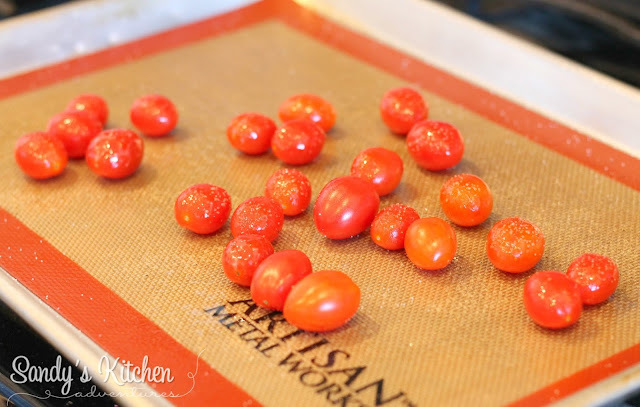 Put cherry tomatoes on a baking sheet lined with non-stick foil or a silicone mat. Spray with non-stick cooking spray. Sprinkle with salt and pepper. Bake for 15 to 20 min. 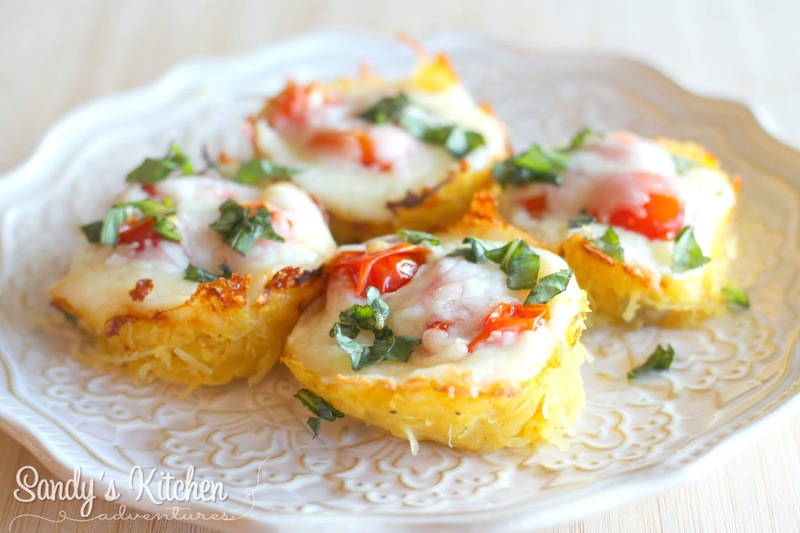 Save time by roasting them with the spaghetti squash nests. Scoop roasted tomatoes into each cup. I had 24 cherry tomatoes so I put 3 in each cup. Top each cup with 2 tbsp mozzarella cheese . Bake for an additional 8 to 10 min or until cheese has melted. Garnish with chopped fresh basil. 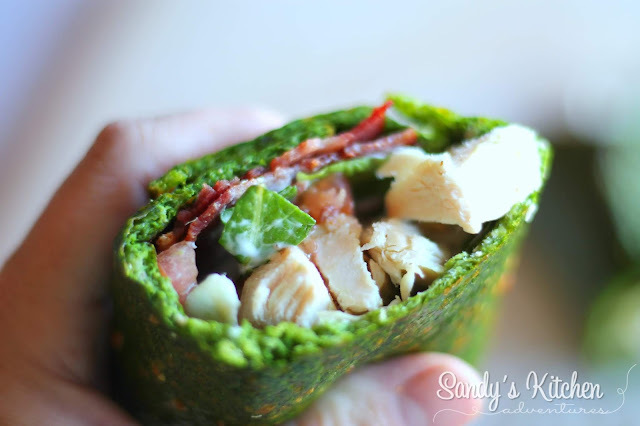 You can enjoy 4 of these delicious nests with 1/2 a Lean more! I served these with 3 oz of rotisserie style chicken breast meat (bones and skin removed) I picked up from the grocery store. So yummy! Preheat oven to 375. Wash spaghetti squash. With a sharp knife, slice spaghetti squash in half lengthwise. If the squash is too hard to cut, puncture several holes around the spaghetti squash and microwave for 3 to 5 min to soften a little. Let cool before cutting in half. Scoop out the seeds and stringy flesh. Spray lightly with cooking spray. Place squash cut side down. Bake for 40 to 45 min. Let cool. Shred the flesh into noodles with a fork. Reserve 2 cups for recipe. Wash spaghetti squash. Puncture several holes around the spaghetti squash. Place the whole spaghetti squash in the slow cooker with 1 cup water. For a 3 to 4 lb medium squash cook on LOW for 5 to 6 hours or 3 to 4 hours on HIGH. Let cool for about 15 to 30 min before slicing in half. Scoop out seeds. Shred the flesh into noodles with a fork. Reserve 2 cups for recipe. In a medium sized bowl, combine spaghetti squash, salt, pepper, garlic powder, and liquid egg whites. 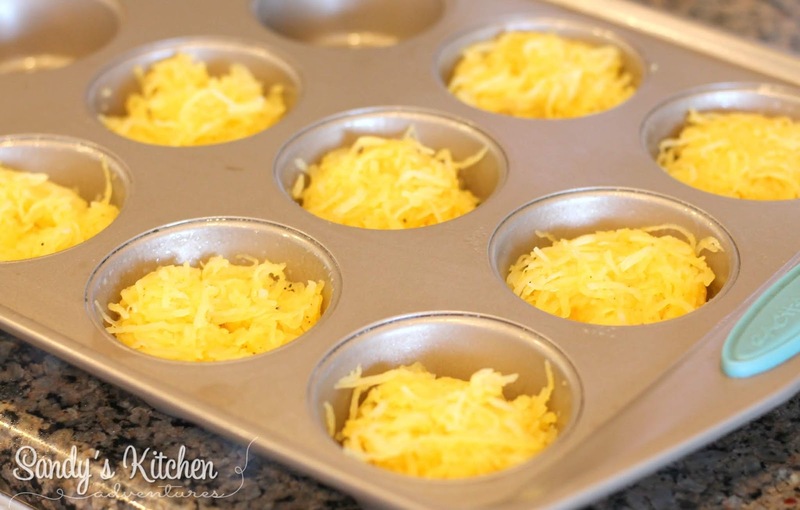 Transfer 1/4 cup spaghetti squash to each muffin cup, pressing down on the bottoms and sides to form nests. Place in the preheated oven and bake 18 to 20 min. 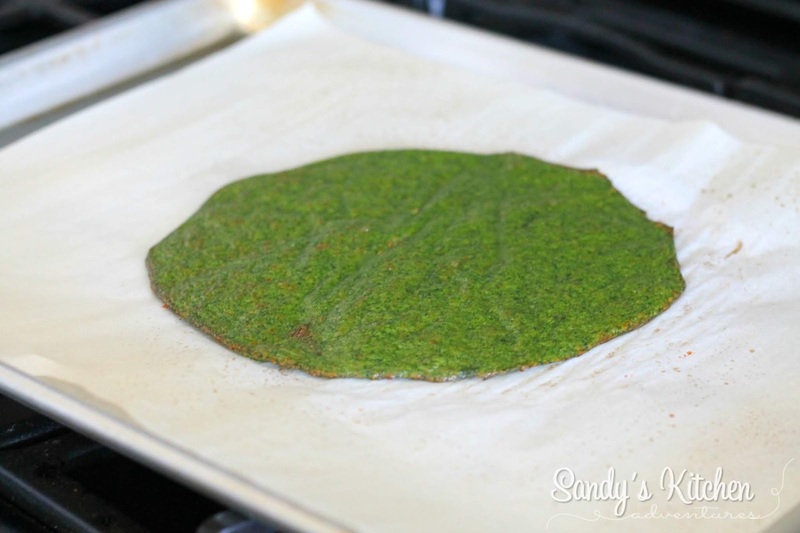 Line a baking sheet with non-stick foil or a silicone mat. Spread tomatoes on baking sheet. Spray with non-stick cooking spray. Add salt and pepper. Bake for 15 to 20 min until tomatoes are soft. These can be put in the oven the same time as the spaghetti squash nests since they cook at the same temperature. Scoop roasted tomatoes in each cup. Sprinkle 2 tbsp of cheese per cup. Bake for an additional 8 to 10 min or until cheese has melted. Let cool for a few min. Carefully scrape around the edges of each nest with a butter knife and remove from the tin. Place on a serving platter. Sprinkle with fresh basil. 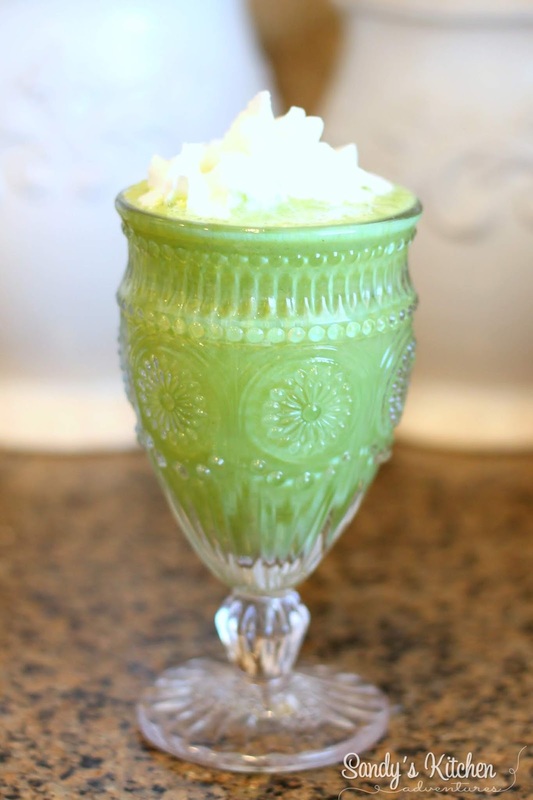 Looking for a yummy shake to enjoy on St. Patty's Day? Try this green shake! Baby spinach gives this shake it's nice green color without any added food coloring. 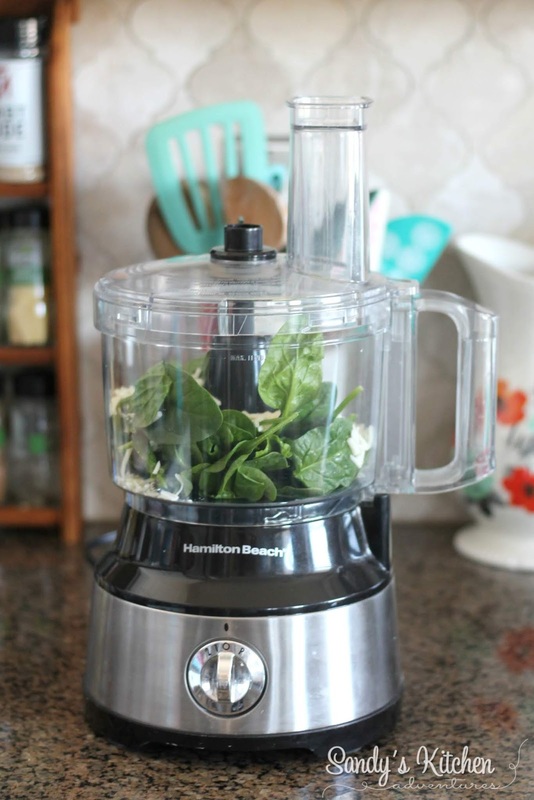 I like to use baby spinach instead of regular spinach for shakes because it has a milder sweeter taste than regular spinach. What is great is that spinach is a super food with loads of nutrients, tons of health benefits, and only 7 calories for 1 cup! Just remember to subtract from your 3 Greens for the day! 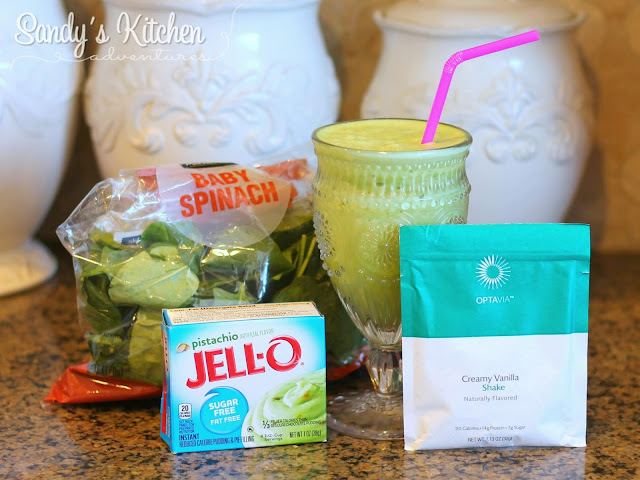 Adding spinach to your shakes is a great way to sneak your veggies in if you are having a hard time eating them all at once! The sugar free pistachio pudding is for added flavor. I love pistachios and I thought the color would be fitting for St. Patty's Day! I added 2 tbsp Reddi Whip for an additional Condiment, but you can definitely leave it out. Enjoy! Blend all ingredients in a blender until well blended. Serve. 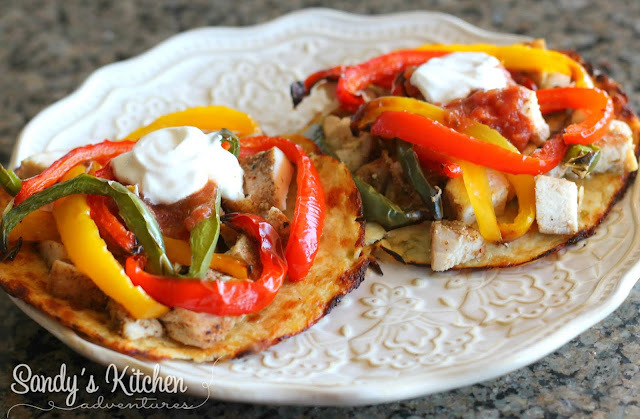 These Chicken Fajita Flat Breads are another great way to enjoy the Cali'flour Foods Flat Breads! I love using them as soft taco shells and filling them up with my favorite fillings! 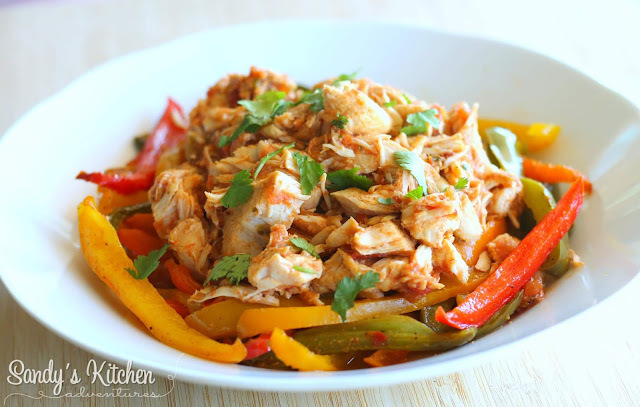 Chicken seasoned with fajita seasoning and topped with sweet bell peppers that are cooked in the air fryer are delicious! Add a little bit of sour cream, salsa and avocado and you have a quick and delicious meal! Plus you don't have to spend hours in the kitchen! Enjoy this simple recipe! These flat breads count as 1/3 Lean and 2 Greens on our program! Add 1/3 Lean and 1 Green more and you have a complete Lean and Green meal! Each flat bread is only 70 Calories, 3 g of Carbs (2 g Net), and 6 g of Protein! They are made with only a few clean ingredients which are cauliflower, egg whites, and mozzarella cheese so they are grain free and gluten free! Yes!!! When ordering these flat breads or pre-made Cali'lite crusts (1/2 Lean, 3 Greens for the entire crust), use Code SANDY to save 10% off your entire order over $50! Place flat bread on a pizza screen or on a baking sheet lined with parchment paper. Bake for 12 to 14 min. Switch the oven to broil and broil for a few min or until golden brown. Let cool for 10 min. Spray a non-stick skillet with cooking spray. Heat over medium high heat. Add chicken and fajita seasoning. Continue cooking chicken for about 3 to 4 min or no longer pink. Place 2 oz of chicken, 1/4 cup roasted peppers, 1/2 tbsp sour cream, 1/2 tbsp salsa, and 1/2 oz avocado on each flat bread. Enjoy! *If you would like to add 1/3 cup reduced fat, decrease the chicken to 2 oz (1 oz per flat bread) and skip the avocado. This recipe is so easy to make! 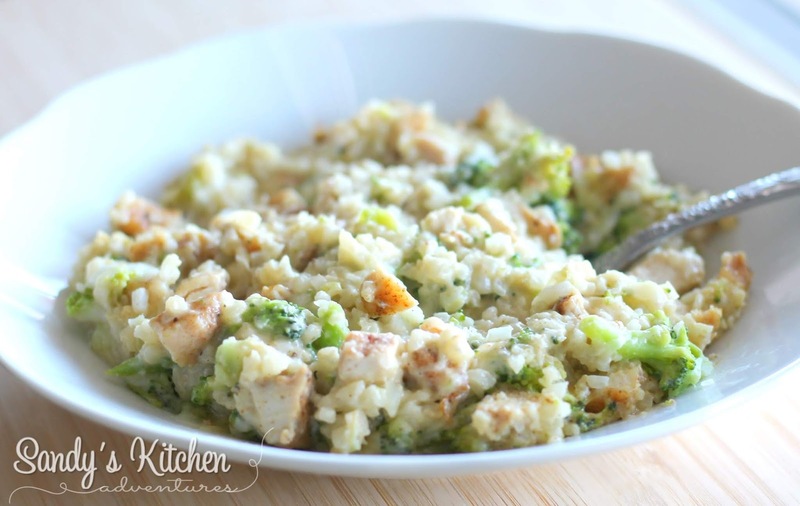 Your family will love this healthier low carb version of chicken broccoli and rice casserole! 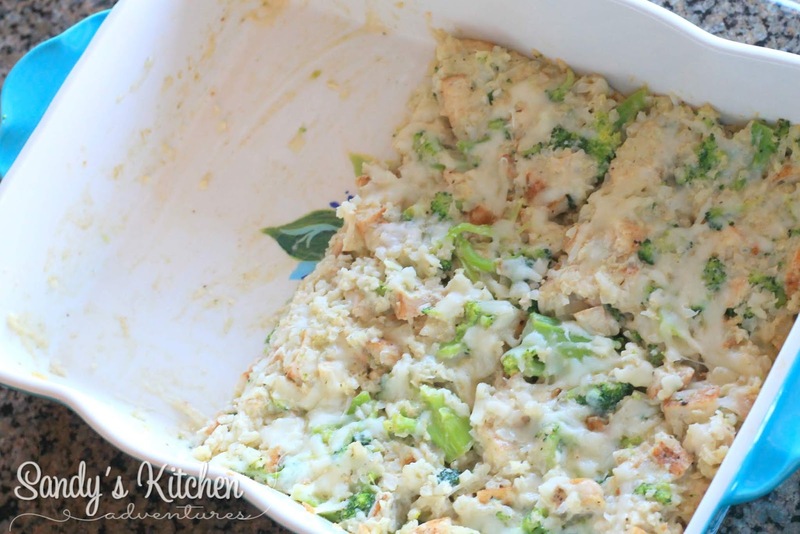 Perfect for a quick weeknight meal! Using steamable bags of cauliflower rice and broccoli makes prepping this meal a cinch! Pick up a whole rotisserie chicken from your local grocery store, remove the skin and bones, and chop up the breast meat to save time if you are in a hurry! This is a slightly adapted version that Brittany Hanson Luder shared with me! Thank you Brittany! 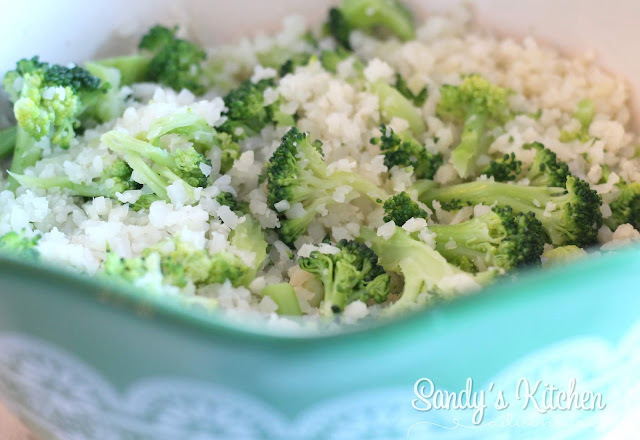 Begin by microwaving the frozen cauliflower rice and broccoli florets following the directions on the back of the packages. Measure out the appropriate amounts needed and place in a large bowl. 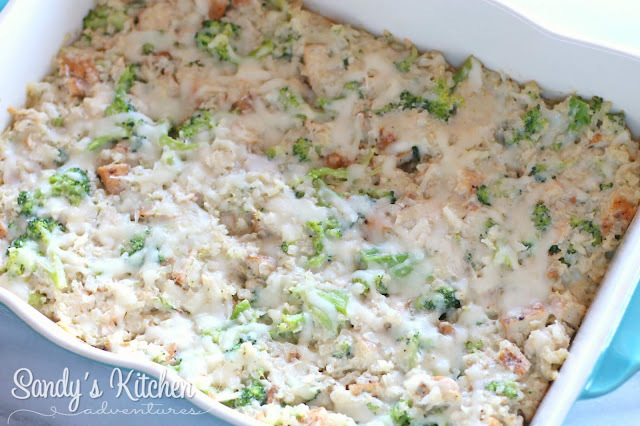 Add chopped chicken, 3/4 cup cheese, reduced fat alfredo sauce and grated parmesan cheese. I used mozzarella cheese but cheddar cheese would be yummy too! Stir until everything is combined. Pour mixture into a 13" x 9" casserole dish and spread evenly. Top with remaining 1/4 cup of cheese and bake for about 15 to 20 min or until cheese has melted and casserole is warm. Divide into 3 portions. You can have 1/3 of this casserole! Make sure you are hungry! It is a lot of food! 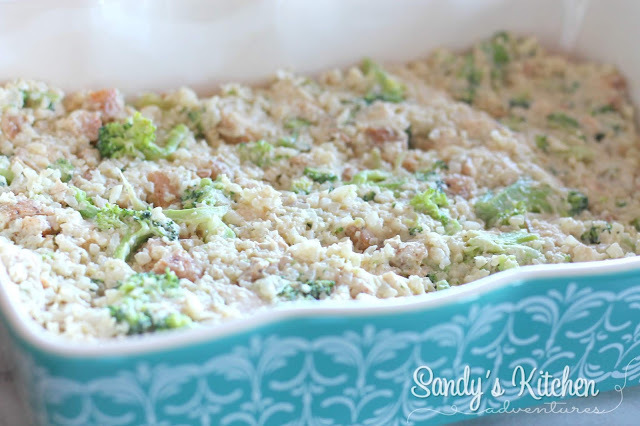 This casserole dish did not disappoint and is literally ready in less than 30 min! Comfort food at it's best! Lightly spray a 13" x 9" casserole dish and set aside. 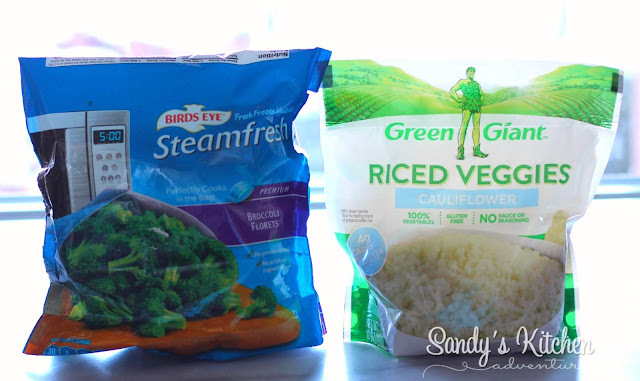 Steam cauliflower and broccoli in the microwave following the directions on the back of the packages. Measure out 3 cups cauliflower rice and 1 1/2 cups of broccoli and place in a large bowl. Add cooked chicken, 3/4 cup cheese, alfredo sauce and parmesan cheese. Stir until combined. Pour mixture in prepared casserole dish and top with remaining 1/4 cup of cheese. 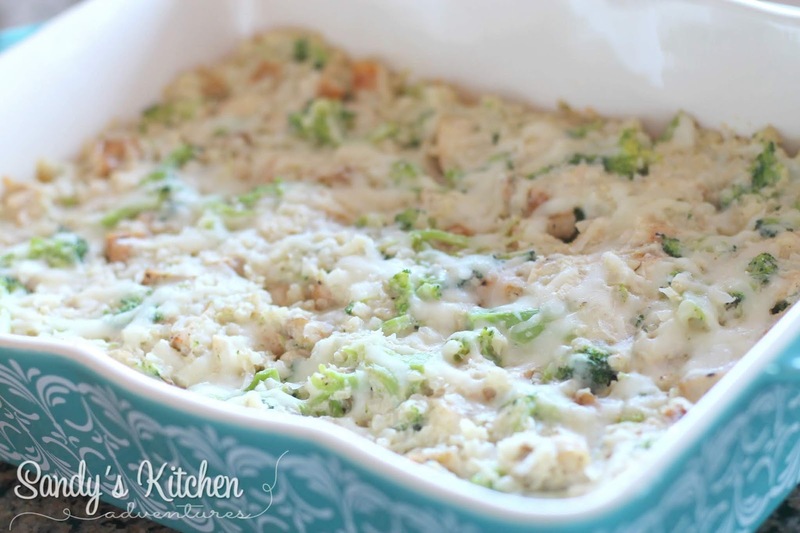 Bake in oven for about 15 to 20 min or until cheese is melted and casserole is warm. Divide into 3 equal portions. Enjoy! *Use the breast meat from a rotisserie chicken found at your local grocery store to save time! They are already seasoned and cooked for you so no need to add additional spices. 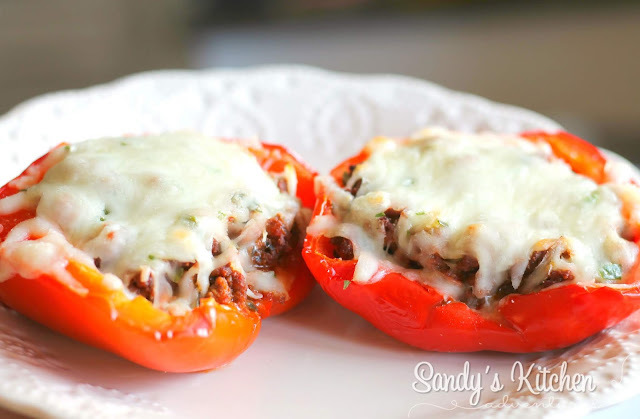 Italian Beef Stuffed Peppers are an easy healthy recipe the entire family will love! They are hearty and delicious plus gives you one whole meal in an entire dish! Start off by pre-cooking your peppers unless you like your peppers crunchy. I baked my pepper halves for about 15 min, but you can also place them in boiling water for 3 to 5 min or use the microwave to soften them up a bit. Brown the ground beef, then add seasonings and parmesan cheese. Stir in marinara sauce at the end. Stuff the peppers with the meat filling. Cover the peppers with foil and bake 10 to 12 min. 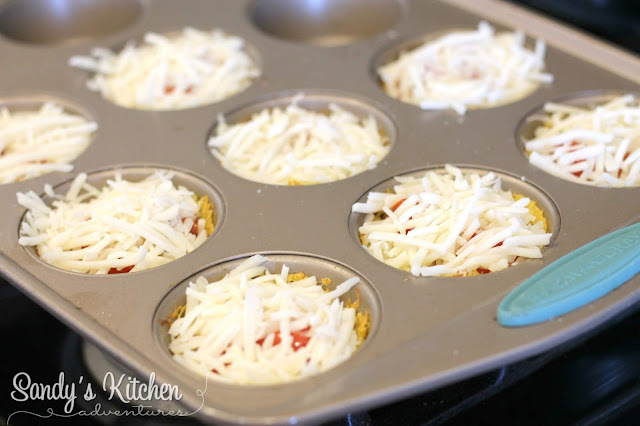 Remove foil, add mozzarella cheese and bake an additional 5 min or until cheese has melted. Enjoy! Remove top, seeds, and core from bell peppers. Rinse, pat dry and cut in half lengthwise. 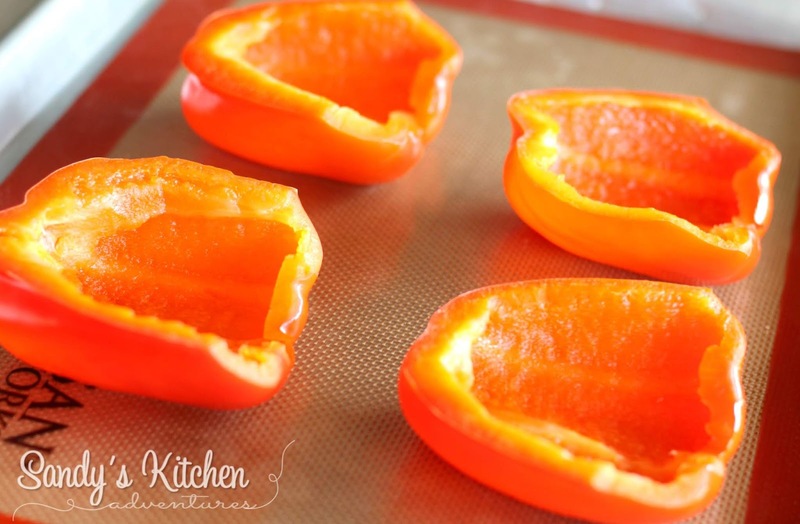 Place peppers on a baking sheet and bake 10 to 15 min or until peppers start to get soft. Meanwhile, cook ground beef in a medium sized skillet over medium high heat. When beef is almost cooked through, add garlic powder, salt, pepper, Italian seasoning, and grated parmesan cheese. Continue cooking until meat is fully cooked. Stir in marinara sauce at the end. Set aside. Scoop 1/4 of the meat mixture into each pepper half. Cover with foil and bake for 15 min. 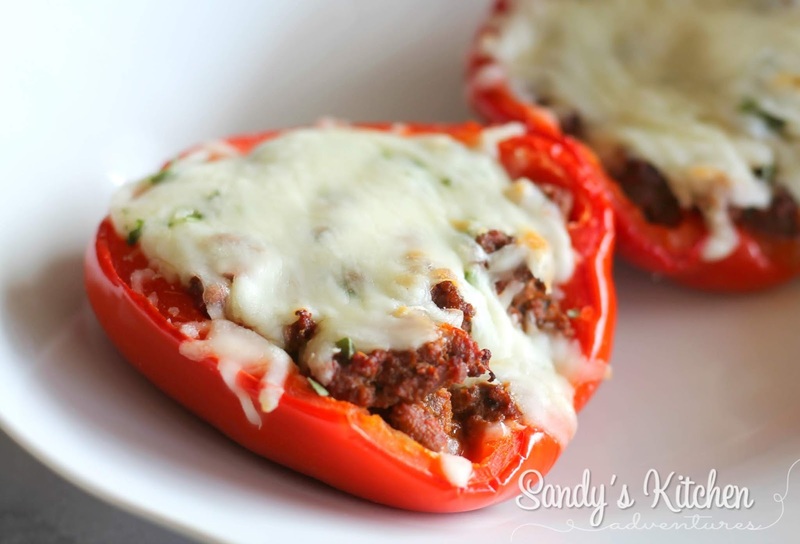 Remove foil and add 2 tbsp of cheese over each pepper half. Bake for an additional 5 min or until cheese has melted. * Here are some options for approved marinara sauces, but of course not limited to just these below. When choosing a sauce, it must contain less than 50 Calories, less than 5 g of Carbs, less than 200 mg Sodium, and less than 3 g Fat per 1/4 cup.